Fourth Row Center: Film Writings by Jason Bailey: On DVD: "Inglourious Basterds"
One of the problems with being a genius, and being recognized and branded as such, is that there isn't anyone around to question your judgment any more. Quentin Tarantino's Inglourious Basterds is a giddily enjoyable, thrillingly excessive pop confection with a genuine kick and undeniable snap. But somewhere along the line, a producer or studio head or someone in power needed to sit Tarantino down and explain, very gently, that his movie is a good twenty minutes too long, and the excesses present within that twenty minutes are what prevents his new film from achieving the dizzying heights of his previous ones. As with Kill Bill, Tarantino uses a chapter format to structure his multi-faceted tale, which takes place "once upon a time... in Nazi-occupied France." We're first introduced to Col. Hans Landa (Chrisoph Waltz, terrific), an SS officer who has been nicknamed "The Jew Hunter" (everyone in this movie has a nickname). The lengthy, occasionally stilted opening sequence finds Landa slowly but surely coaxing a confession out of a French farmer (Denis Menochet) who is hiding a Jewish family. I see what Tarantino is going for in this scene; he's doing a slow wind-up for a brutal first pitch. But the effect is overdone--the sequence drags, on and on, and when the payoff comes, it's not worth the wait. What's more, we're not exactly sure why one member of that family, Shosanna (Melanie Laurent), is allowed to escape, except that she's needed in the rest of the film. 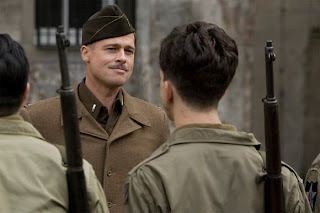 However, as quickly as we're tested, Tarantino plunges us into Chapter Two, which introduces us to the title "basterds"--a crew of tough Jewish foot soldiers on the hunt for Nazi scalps, led by Lt. Aldo Raine (Brad Pitt), a tough-talking hillbilly badass with an undeniable skill at turning a colorful phrase. Thanks partially to the writing and partially to Pitt's bound-to-be iconic performance, the movie bounces back from its languid open and comes out swinging; the dialogue is terrific, the shooting and cutting is first-rate, and the entire enterprise is deliciously, deliriously over the top. Within that chapter, and the best scenes of the film, Tarantino is doing what he does best--pulling from the full spectrum of his influences (from Leone westerns to 60s American action cinema to--unexpectedly--blaxpoitation to the Italian exploitation movie that lent this one its name) and pulling them together into a sticky clay that he reshapes for his own purposes with his unique, particular voice. There's also a lovely touch of French New Wave to Chapter Three, in which Frederick Zoller (Daniel Bruhl), a German soldier turned movie star tries to court Shosanna, who is masquerading as a French woman and running a cinema. In an ultimately ill-advised attempt to get into her good graces, Zoller convinces Goebbels (Sylvester Groth) to hold the gala premiere at her theater--with much of the high-ranking Nazi brass in attendance. The remainder of the film concerns the simultaneous preparations of Shosanna's simple plan for revenge, and the more elaborate "Operation: Kino," a collaboration between British intelligence and the Basterds to take out the theater and all the Nazis in it. That pairing leads to the film's least successful sequence, a momentum-killing meeting between a British agent, two of Ray's men, and double agent Bridget von Hammsersmark (Diane Kruger) in a French tavern, in which the Brit is in danger of being made by Nazi soldiers having some schnapps. Again, you can see what he's trying to do here--a long, slow buildup to a big confrontation, with tension and dread bubbling underneath. But he drags it out for so long that the sequence goes slack; the scene is endless (it runs at least twenty minutes and feels twice as long), spent away from any of our primary characters of interest, and in retrospect, it doesn't really forward the narrative all that much. What seems to be happening here, as in a couple of the weaker scenes in Death Proof, Tarantino's half of Grindhouse, is that he's become self-indulgent with his dialogue--he's in love with the sound of his own words (even more so, his own words translated into foreign tongues). There is no question that he established himself, and quickly, as the preeminent dialogue writer of his generation. But the genius of the conversations in Reservoir Dogs or Pulp Fiction or Jackie Brown was not mere loquacity. It was in his keen ability to drive characterization with dialogue, to tell us about who people were predominately through the subtext of the things they said. In his more recent work, people are just talking to hear themselves talk--or, more accurately, talking for their creator to hear them talk. If this assessment seems harsh, it should be noted that even the film's transgressions don't sink it--it's too big and bold and intoxicated with itself for that. Performances are sharp from top to bottom (Laurent is a real find, and her moment of release after a terrifyingly dangerous conversation is a wonderful little touch), Tarantino's macabre sense of humor shines through beautifully, and the final forty minutes or so--the big premiere, with all of its subplots and subterfuge--is flat-out virtuoso filmmaking. What it does, it does so well (and with such a snazzy bang) that one is tempted to overlook its flaws. But they are there, and at a couple of points, they stop the movie cold. It appears that the only thing preventing Inglourious Basterds from the greatness it is so clearly striving for (and that we go into it rooting for) is its own deficit of restraint. In its best set pieces, the picture is tight, lean, mean, and cool as a cucumber. But Tarantino didn't have the discipline to dig the best stuff out. As a director, the first thing you do in post-production is assemble everything you shot into your first cut. Then, the old saw goes, you have to go in and cut out all the little things you're in love with, because they're slowing down the movie. Tarantino seems to have released his first cut. "Inglourious Basterds" hits DVD and Blu-ray today. In Theaters: "The Young Victoria"
In Theaters: "A Single Man"
In Theaters: "A Town Called Panic"
On DVD: "Jim Jeffries: I Swear To God"